6.1 What If I Want To Focus The Activity To Improve The Child’s Aerobic Capacity? 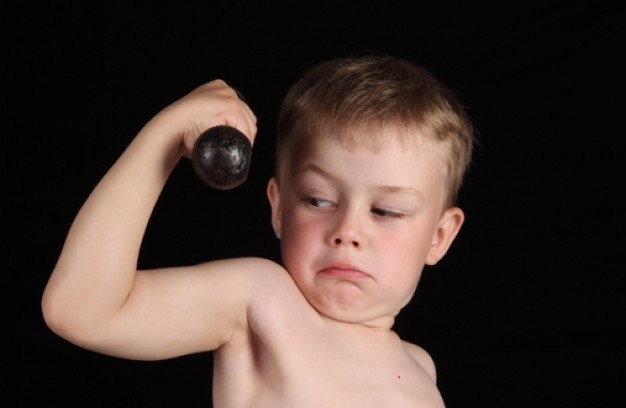 6.2 What If I Want To Focus On Improving The Child’s Muscle Strength? 8.3 What Can Mainstream School Teachers Do? This article is designed primarily for teachers and staff in mainstream schools. The aim is to highlight, educate and create awareness about the benefits and requirements of physical activity for children diagnosed with cerebral palsy (CP) in a mainstream school setting. It is hoped that the principles highlighted will be of benefit to mainstream school teachers and the wider population, seeking to promote daily physical activity amongst children with CP. Recognize and describe the common clinical manifestations of CP and the potential impacts on participation in the school setting. 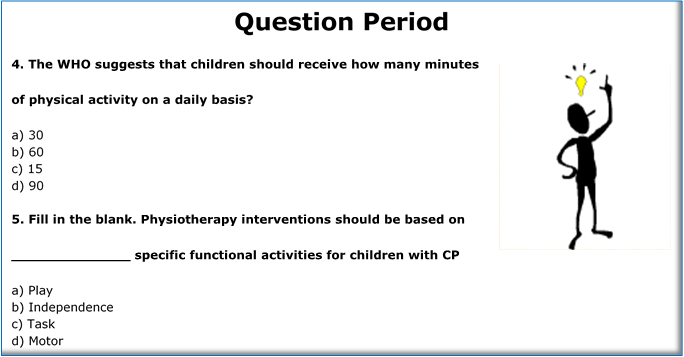 Evaluate the importance and benefits of physical activity in students with CP. Demonstrate improved awareness and application of current guidelines and recommendations for students with CP in the mainstream school setting. In the western world, a total of 2-2.5 of every 1000 born children have CP. The condition is caused by a brain injury or malformation which occurs during either the fetal development, at birth or after birth while the brain is still developing. SPASTICITY – This causes the muscles to become stiff, making movement difficult and the muscles are referred to as having 'high tone'. Spasticity is present in around 80% of cerebral palsy cases. ATHETOID OR DYSKINESTIA – This causes unwanted abnormal movements and involuntary muscle spasms which can be difficult to control and are sometimes painful. These are a result of incorrect signals from the brain which cause fluctuations in muscle tone that affects the entire body. 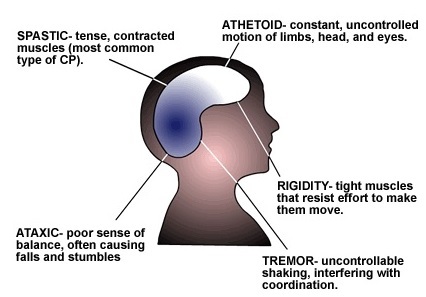 It occurs in 10-20% of cerebral palsy cases. ATAXIA – this causes the muscle to have low tone and is often described as being floppy. There is generally a disturbance of the coordination of voluntary movements due to muscle dyssynergia which leads to an unsteady gait and difficulty with fine motor tasks. It affects 5-10% of cerebral palsy cases. MIXED GROUP - Individuals in this group generally have a combination of the above mentioned dysfunctions. HEMIPARESIS (hemiplegia) - predominantly unilateral impairment of arm and leg on the same side. DIPLEGIA - motor impairment primarily of the legs (usually with some relatively limited involvement of arms). QUADRIPLEGIA (tetraplegia) – all four limbs are functionally compromised. MONOPLEGIA - only one limb is affected. Motor Functional status can be categorised by using the Gross Motor Function Classification System (GMFCS). 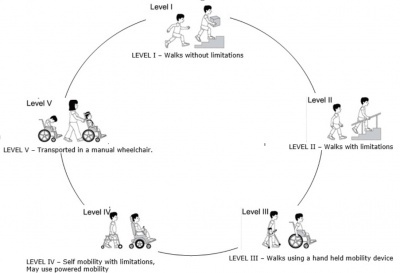 This classification system groups children with cerebral palsy into one of five levels dependent on functional mobility or activity limitation and the distinctions between levels must be meaningful in everyday life. 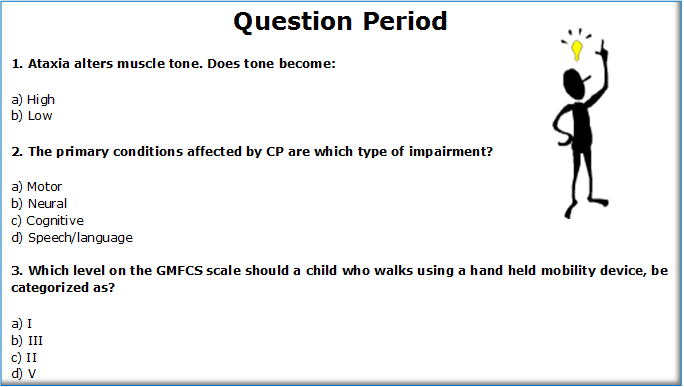 The GMFCS for cerebral palsy is based on self-initiated movement, with emphasis on sitting, transfers, and mobility. Distinctions are based on; functional limitations, the need for hand-held mobility devices or wheeled mobility, and to a lesser extent quality of movement. In 2007 a revised and expanded GMFCS was released. This broke down the categories for different age groups, namely; before 2nd birthday, between 2nd and 6th birthday, between 4th and 6th birthday, between 6th and 12th birthday and between 12th and 18th birthday. A large proportion of children with cerebral palsy have learning difficulties, even though they have a similar range of intelligence as able-bodied children. The prevalence of learning difficulties increases when epilepsy is present. Children with CP often show signs of challenging behaviour. This can be due to a number of factors including environment, interpersonal relationships and a combination of physical and psychological impairments. This can be a major challenge to professionals, teachers, carers and parents. Q. Is CP a life threatening condition? With the exception of children born with very severe cases, CP is considered to be a non life threatening condition. The vast majority of children with CP are expected to live well into adult life. Q. Is CP a curable condition? Unfortunately CP is not a curable condition. CP is damage to the brain that cannot be reversed. However treatment and therapy can help manage its effects on the body. Q. Is CP a Progressive Condition? No, CP is not a progressive condition due to it being as a result of a one time brain injury and no further degeneration of the brain will occur. Q. Is Cerebral Palsy a permanent condition? 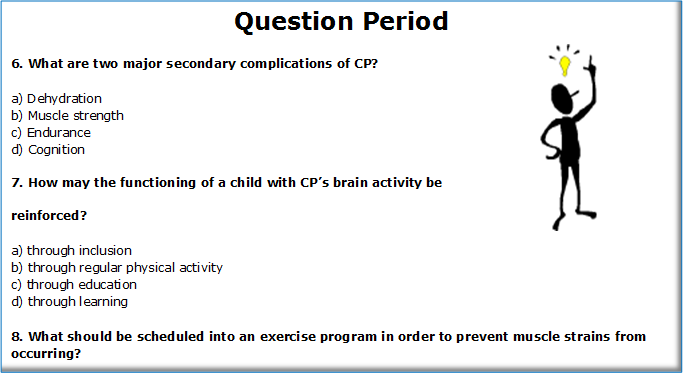 Yes, CP is permanent as the injury to the brain is permanent. The brain does not have the have the same healing properties as other parts of the body. Due to this, CP itself will not change for better or worse throughout the individuals lifetime, however associative conditions may change over time. Q. Is Cerebral Palsy manageable? Yes!! Treatment, therapy, surgery and technology can help maximise the independence of individuals with CP. These can help reduce barriers, increase inclusion and lead to a better and enhanced quality of life. Q. Is Cerebral Palsy a chronic condition? Yes, the effects of CP are long term, not temporary. An individual diagnosed with CP will have the condition for the entirety of their life. According to the literature, physiotherapy interventions for children with CP should focus on developing motor ability and maximizing capacity in order for the children to be able to perform ADL’s. 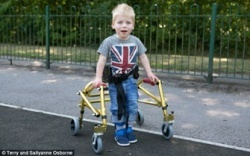 Muscle weakness has been found to be an important aspect of motor control which can hinder children with cerebral palsy and reduce their quality of life. As a result of this, muscle strengthening programmes have been promoted in recent years in an effort to maximize function for those affected. Also, strength training has been found to increase functional ability, participation in school, leisure, and social and family events. This requires the interventions to be based on task-specific functional activities, motor learning processes and a family-centred approach. Therefore, the school environment is an ideal setting for promoting motor learning during daily physical activities. In addition to this, the W.H.O recommends that children and adolescents should have at least 60 minutes of moderate to vigorous intensity activity every day. In order to facilitate this amount of physical activity, many children with cerebral palsy require stretching and postural management, including the use of foot orthoses, walking frames and wheelchairs. Teachers must be aware of the specific requirements of each individual child with cerebral palsy, as the primary aim of treating this condition is about maximizing the child’s potential and quality of life. All referred children should promptly receive a physiotherapy assessment, as well as an occupational therapy one where necessary. A tailored programme of physiotherapy should be offered that meets the individual needs and goals of each child, with an emphasis on skill development, function, and ability to participate in ADL’s. It should also incorporate the prevention of pain and/or contractures. Careful consideration should be given as to who is delivering the physiotherapy. If parents or carers want to deliver the therapy, they may need some specific training and guidance. Their wishes should be taken into account when deciding on what option to take. Parents, carers and the children should be encouraged to incorporate physiotherapy into ADL’s where possible. 24 hour postural management strategies should be used to reduce contractures and promote participation in activities. Constraint induced movement therapy (CIMT) can be introduced to help improve manual skills. This involves restraining the unaffected arm in order to encourage use of the other arm. Muscle strengthening therapy should be implemented when muscle weakness is causing postural problems or a loss of function for the child. Teachers may need to consult a physiotherapist for further information and guidance relating to certain techniques such as CIMT, muscle strengthening therapy and 24 hour postural management. With the successful implementation of the above strategies, the next goal to be achieved is to get the child as physically active as possible. Again, certain precautions and considerations must be taken into account prior to undertaking any exercise or physical activity with this type of student. In the past, physical activity was commonly avoided due to the concern about the effect of such effort on muscle spasticity and children’s movement patterns. In addition, secondary changes contribute to a vicious cycle whereby the disability leads to deconditioning, which ultimately worsens the level of the disability. However, recent research has shed light onto physical activity as a primary combatant against the secondary complications of cerebral palsy, providing adolescents living with the disease with improved body function, participation, perception of self-worth, and functional competence. The natural aging processes for everyone involves the gradual loss of muscle strength, elasticity, and bone density which poses a distinct threat for those with CP who are already compromised in these areas. Unfortunately, this results in a drastic number of adolescents with CP to enter into their early adulthood and experience a loss of independence much sooner than their age-matched peers. These findings are of concern because the benefits of physical activity and exercise to overall health are well known and those who are diagnosed with a disability are less likely to adopt physically healthy lifestyles than those without disabilities. Physical activity and exercise are quickly becoming recognized interventions for children with CP to improve levels of muscle strength, aerobic capacity, and muscle function. Due to the existing impairments that many adolescent teens living with CP have, activities such as walking independently, negotiating stairs, running, and even navigating uneven terrain proves to be difficult. Because of this, the primary therapeutic goal for carers for children with CP is to improve their ability to perform meaningful, functional tasks in everyday life (i.e. walking, stair climbing, etc.) and thereby changing the level of the disability. The United Cerebral Palsy Research and Educational Foundations’ exercise principles and guidelines for persons with CP and other neuromuscular disorders gives an insight into what type of preparation is required for safe and effective exercise in this demographic. In addition, the benefits of physical activity will be discussed, such as enhanced muscle strength and endurance, increased cardiorespiratory fitness, improved bone structure and strength, heightened self-perception, and lastly boosted participation levels. A health care professional should be consulted prior to undertaking any exercise program. Designing a specific, individualized program can be important for meeting the needs and goals of the individual. Consideration should be given for any special equipment or assistance that may be required depending on the level of the child. Realistic goals should be set at the beginning. Regular exercise should be undertaken by each individual – around 3-5 times per week. Exercise should aim at strengthening weak muscles and stretching tight muscles. It is important to progress the duration, intensity and, frequency of the of the exercise sessions gradually. Extra caution should be given for children with contractures in order to minimize muscle strain. Lightheadedness, chest pain, difficulty breathing, excessive fatigue, nausea, moderate to severe joint or muscle pain are all important danger signals. Exercise should be stopped immediately and not started again without consulting a health professional. Any child undertaking exercise should drink plenty of water before, during and after exercise. Temperature, humidity, and length of the workout will dictate how much water is required also. Appropriate clothing and footwear should be worn at all times - any loose clothing may potentially cause an accident. Also, headgear and knee and elbow pads may be needed during certain activities. Extra precautions must be taken during times of extreme heat or cold. This means adjusting the length of time spent exercising as appropriate. For example, the length and intensity of the workout should decrease as the temperature and humidity increase. Medications can alter the body’s response to an exercise program. Parents, carers and the individual themselves should be aware of the potential effect this can have and whether it impacts on their ability to participate. Again, consultation with a HCP may be required. Weight bearing and joint flexing exercises must be done with caution by persons with significant contractures and/or loss of bone density. A warm-up period of 5-10 mins. 2-5 mins to warm-up the muscles and joints to be exercised. A specific exercise activity such as aerobic exercise, resistance exercise, swimming, hydrotherapy, or cycling for at least 20-30 mins. A cool down period of at last 5 mins. 2-5 mins of stretching, including muscles and joints of primary concern. Reduced muscle strength and endurance are major secondary complications of CP. Strength training is an excellent way to reduce muscle weakness, thereby increasing the overall functional ability. As mentioned earlier, one of the hypothetical contraindications for using strength training to minimize muscle weakness was because it would inadvertently increase the strength of the muscles that are already overactive, increasing the patients ‘stiffness’. ;However, studies proving this to be false have shed new light onto the importance of strength training as an efficient intervention. Research has supported the notion that strength is directly related to motor function; strengthening programs focusing on the lower extremities have been shown to improve functional abilities such as walking. ;Additionally, improvements were found in the scoring of the GMFCS upon strength training completion. The improvements found in gross motor function promotes physical exercise as a major intervention because it was previously believed that gross motor development did not significantly increase after the age of seven in children with CP. Using a strength training program is also an excellent way to overcome tight muscle groups. By focusing exercise on the muscle groups opposite the tight muscle groups. Over time, the increase in strength of the weaker muscle will compensate for the tight muscle, improving the functional capacity of the child. An example of this could be if the flexors of the elbow are tight (e.g. the biceps), stretch and strengthen the elbow extensors e.g. the triceps). Recent evidence has highlighted the importance of physical activity for the establishment and reinforcement of the body’s electrical signals that send information regarding physical movement and sensation to, and from the brain. The phrase, ‘if you don’t use it , you lose it’ holds true in this scenario- if activity was to be significantly reduced in children and adolescents with CP, then the functioning of these electrical signals would be altered, reducing the individual’s functional ability and independence. In the initial stages, strength training can be anything that challenges your body to move more weight than it is accustomed to. It doesn’t necessarily have to take place in the gym; lifting a tin of beans or water jugs can be classified as strength training and can be quite taxing on the body depending on the weight, repetitions and exercise selection. It is important to keep in mind that higher weight, not repetition, increases strength. A good way to start the strength training program is to perform 10 repetitions of the exercise at a slow, smooth pace, with a light weight as to prevent fatigue. Gradually increase the resistance and reduce the number of repetitions as you progress through the program. In order to prevent muscle strains from occurring, it’s vital to have a warm-up and stretching period before and after the strength training exercises. For persons with athetosis (involuntary body movement), free-weight exercises (i.e. bar bells) should be approached with caution or avoided all together. 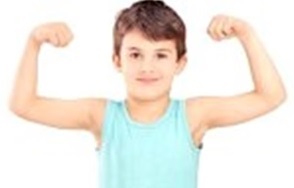 Strength training programs lasting anywhere from 6 to 12 weeks have been shown to provide children with significant enhancements in muscular strength. Even programs of shorter duration have been shown to improve walking, wheelchair propulsion, and other aspects of motor performance. With that being said, it is important to note that training needs to be continued regularly and incorporated into daily life in order to retain the benefits. Due to the intensity and the need for the muscles to rest and recover, strength training should not be performed for long durations at frequent intervals. Physical activity provides optimal results if done more frequently with varying intensities and types of programs in order to reduce the occurrence and degree of CP’s associated secondary complications. Children with CP have significant difficulty performing purposeful, energy efficient physical movements for the many reasons previously mentioned. A child’s ability to play and exercise at intensities sufficient enough to develop cardiorespiratory fitness is limited.Cardiorespiratory fitness refers to the ability of the circulatory, respiratory, and muscular systems to supply oxygen during sustained bouts of physical activity. If reduced, it means excessive energy expenditure is used for everyday activities (e.g. walking). Children with CP use 2 to 3 times more energy than children without disabilities, resulting in the child to tire much sooner. Aerobic exercise is any activity that raises your heart rate and gets you out of breath for a sustained period of time. However, in comparison to their typically developing peers, children with CP have distinctly subnormal aerobic and anaerobic (high intensity, short duration exercise lasting < 1 minute) capacities, in addition to reduced muscle mass and strength. Training programs lasting 8-months utilizing standardized exercises for both aerobic and anaerobic capacity can greatly benefit children with CP. Results from programs such as these have shown significant increases in aerobic and anaerobic capacities, in addition to improvements in agility, lower limb muscle strength, and athletic competence. Other studies examining solely aerobic exercises have shown an increase in physical work capacity, resulting in increased running ability and energy efficiency. A school-based sport and exercise program found similar findings when it assessed the cardiorespiratory changes of children with CP after engaging in either cycling, swimming, wheelchair propulsion, running or mat exercises 4-times a week. When compared to a group of children with CP who did not partake in these exercises (the control group), the children participating experienced a significant improvement in their aerobic capacity and avoided the increase in fat mass seen in the control group over the same period. These results reflect the fact that a child will be able to use their body’s energy more efficiently and do more work in a given time frame with reduced fatigue. As noted briefly earlier, aerobic exercises are excellent ways to control body weight; optimal results are seen when aerobic exercise is done 3-4 times per week. When first attempting aerobic exercises, it is important to start at a low intensity and for a short duration in order to develop an understanding of the body’s current aerobic capacity. At first, attempt 5-10 minutes of exercise and gradually increase the duration to 20-60 minutes as the individual’s exercise tolerance builds . the legs. It can be done indoors in a stationary position or outdoors where the child can ambulate independently. If the child is cycling outdoors, be sure they’re wearing a helmet! CHAIR AEROBICS (CF, M, FR) - For children with a lower degree of function in their legs, chair aerobics is a great way to improve cardiorespiratory fitness, combining upper body movements and stretches for a fun, calories burning workout. done either independently or in a group setting. The exercise is performed to music; it is important to note that the tempo of the music will determine the speed and intensity of the dance – the higher the tempo, the more intense the workout will be, and vice versa. Try and have a specific target heart rate set prior to the start of the exercise. Ideally, the heart rate should be 70%-80% of the child’s maximal HR (the methods for calculating and measuring HR is depicted below in the Aquatic Therapy section). Caution: children with significant contractures or bone density loss should avoid this exercise due to the risk of injury. EXERCISE BANDS (M, B) – These exercises involve the use of coloured resistance bands for the main purposes of muscle strengthening and stretching. The bands are colour coded according to resistance with the more colourful bands providing less resistance and darker bands providing the most resistance. Typically, the band is anchored to a stationary object or body part while the opposite end is either gripped or attached to the body segment being exercised, however, exercise techniques vary. These exercises are an excellent way for children to receive a full body strengthening exercise when a gym is not made available; the bands can easily fit into any bag and are very durable. Be sure to avoid releasing the band when it is in a stretched position in order to avoid harm. also be done outdoors. Fast walking also falls into this category, however, in order to reap the full benefits of both, try to keep a steady pace throughout the exercise. Be sure to use properly fitting shoes with good support. At the start of the program, mild muscle soreness is very common, however if joint discomfort develops, try switching to an exercise that has less impact on the body, such as swimming or walking. Caution: this exercise should be avoided if the child has significant contractures, bone density loss or degenerative joint disease. LEG CYCLING (CF, M, FR) – This can be done on a stationary piece of equipment that has mechanical or electronic programs for controlling resistance and measuring heart rate. Conversely, the child could cycle outdoors using either a 2-wheel or 3-wheel bike, but ensure the child is wearing a helmet! ROWING (CF, M, FR) – This is done on a piece of indoor, stationary equipment that involves the repetitive pulling of both arms against resistance with the coordinated bending and straightening of both legs. This is an excellent exercise that incorporates various large muscle groups into a full body workout. STAIR CLIMBING (CF, M, B) – This can be done on equipment that simulates a set of stairs or stairs themselves. If possible, use equipment that has handrails to provide safety and assistance. SWIMMING AND WATER EXERCISES (CF, M, FR) – It is important to ensure that the pool water is not cold in order to prevent muscles from becoming tight. Ideal temperatures range from 30-34 degrees centigrade (86-93 degrees Fahrenheit); warm water has a relaxing effect and can help decrease muscle tone. When performing the exercises, focus on one area at a time, gradually increasing the intensity and duration as the child’s ability improves. It’s imperative to never let the child swim alone. Additionally, if necessary, use properly fitting flotation de vices. Aquatic exercise will be explored more in-depth later on in An In-Depth Look: Aquatic Therapy. WEIGHTS TRAINING (M, B) – This can be done either with free weights or exercise machines that provide resistance. Weight training can be focused to improve muscular strength or muscular endurance; increasing the load will increase strength while increasing the repetitions will increase endurance. legs. It involves the propulsion of a wheelchair by the arms or legs over an extended distance. 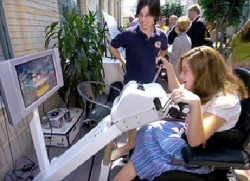 Either a conventional wheelchair or a specialized sport wheelchair can be used. If wheeling outside, ensure precautions are taken to ensure safety whilst in traffic. maintaining positions for short periods of time. Tai Chi involves a series of individual, dance-like movements performed in a slow, rhythmic sequence. Both can be accompanied by music to provide a relaxation response. When practiced regularly, these activities can lead to reduced levels of everyday stress and anxiety, as well as muscle tension, while improving mood, energy, and focus. Individuals diagnosed with CP and other neuromuscular disabilities are at greater risk of being inactive and immobile. Consequently, osteoporosis (the loss of bone density) occurs. As a result, children with mild to moderate forms of CP are more susceptible to bone fractures not only due to reduced bone density, but also because of other factors such as stiff joints, poor balance leading to falls, and violent seizures. Studies examining children with CP found there to be a significant increase in femoral neck (thigh bone) bone mineral density (a surrogate for bone strength) after an 8-month physical-activity program. This is an important finding because the most common fracture site for children with CP is the femur. Although the physical capacity of children living with CP may be greatly restricted, they could potentially benefit from even a minimal weight bearing program activity. With these children, the promotion of active standing and other forms of weight beating activities should be encouraged in order to reduce skeletal fragility and susceptibility to fractures. All children, including those diagnosed with CP, need to have opportunities that not only allow them to participate in physical activities that promote physical fitness, but more importantly, opportunities that provide them with the chance to interact and play with other children. This is why aspects of flexibility and range of motion need to focus on the encouragement of movement opportunities that enable children with CP to experience enjoyable activities while enhancing their physical fitness. Stretching programs incorporated before and after the exercise routines of children with CP are equally as important as the exercises themselves. Stretching will increase muscle extensibility and prevent or delay the need for orthopaedic interventions. Additionally, stretching will help prevent the permanent shortening of muscles or joints from occurring (e.g. muscle contractures), contributing to a reduced stiffness at the joint and decreased functional movement. This is critically important because if the muscle cannot stretch, it lacks the ability to grow with the surrounding bone structure and reduces the child’s flexibility. This can potentially lead to deformities, causing the child pain and discomfort. Passive Stretching: the stretch is performed by another person. The child does not actively participate in this strategy. It’s essential to focus stretching of muscle groups that are causing the most problems with mobility in activities of daily living. Stretch the muscle to the point of tension for 10-60 seconds while avoiding pain. Repeat the stretch 2-3 times repeatedly and do so several times a day to improve flexibility and range of motion. Stretching is most effective if the muscle being stretched is warm so it is important to do light bouts of aerobic exercise beforehand. Remember that the full range of motion at affected joints may not be possible so it is important to work within the child’s own capability. Despite being at a time in their lives where they are still attempting to understand their bodies, thoughts and feelings, young adolescent teens have a well-established perception of body image, due in large part to mass media (i.e. magazines, television, etc.). Recent studies examining the effects of a strength training program on adolescents with cerebral palsy have demonstrated that interventions lasting as brief as eight weeks can significantly improve a child’s perception of body image. Due to the unique buoyancy of water, aquatic exercises provide reduced joint loading and decreases the negative influences or poor balance and postural control. Additionally, aquatic exercises focusing on aerobic capacity and muscle strength can be modified to accommodate the wide range of motor abilities of children with CP due to the resistive forces of buoyancy and viscous drag. The aquatic environment may be more appropriate for non-ambulatory children with CP; attaining sufficient intensity, safety and control over land-based aerobic and progressive resistance exercises for children with poor gross motor control, impaired balance, and significant muscle contractures may pose a challenge. What If I Want To Focus The Activity To Improve The Child’s Aerobic Capacity? Low-impact aquatic exercises can provide children with CP the opportunity to increase their cardiovascular endurance while avoiding further joint trauma and potential injury. The American College of Sports Medicine suggests that in order to target aerobic fitness, the child should engage in an aerobic exercise for 30-60 minutes most, or all days of the week. The exercise should aim to elevate the child’s HR to roughly 70%-80% of maximal heart rate. Heart rate can be gaged using waterproof telemetry heart rate straps or by manually measuring heart rate via the pulse at either the jugular or the radial arteries. (Note: if the child’s maximal heart rate is unknown, you can use this simple equation to acquire it: Maximal Heart Rate: 220-age. It should be noted, however, that this equation provides a rough estimate for where the majority of the population’s maximal heart rates would lie. 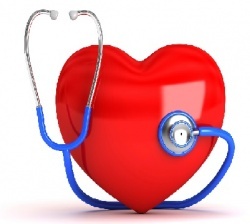 Each individual is different; it is not uncommon to have a heart rate that is above or below the predicted value. What If I Want To Focus On Improving The Child’s Muscle Strength? The ACSM suggests at least 1 set of 8 to 12 repetitions of an exercise to volitional fatigue two times per week. Progressive resistance exercise in water differs from that on land in the way that resistance is applied; in water, velocity and drag are used to produce resistance rather than gravity based weights. As the velocity of an object (i.e. a child’s arm) doubles in the water, resistance provided by water’s drag force quadruples. Essentially, the resistance will increase as a child attempts to move their limb through the water with increasing speed. These unique characteristics may allow children with CP to exercise 5in water with more freedom than land-based exercise environments. The success of exercise also depends on the suitability and safety of the aquatic environment to the child. The use of ramps, chair lifts, stairs, and handrails are excellent examples of equipment that can be used in order to help facilitate access to the water for children of all motor capabilities. Once in the water, it is recommended the child be able to touch the bottom of the pool. It’s equally important to consider the child’s ability to hold the ledge for support or reach the support quickly when need be. This can greatly facilitate a child’s ability and safety in participating, particularly if the child has a balance impairment. In 2005, Schenker’s study found that there were significant differences between participation and activity performance of able-bodied students and students with CP included in mainstream primary schools. Figure 1. 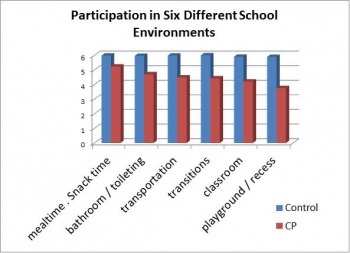 Children with CP had reduced participation in 6 different school environments compared to able-bodied children; the level of participation depends on the physical demand of the environment. For example, children with CP had lower participation levels in activities in the playground, which demands the highest level of physical abilities. Figure 2. 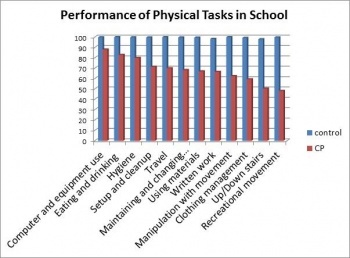 Children with CP had a lower level of performance in physical tasks compared to able-bodied students. Figure 3. 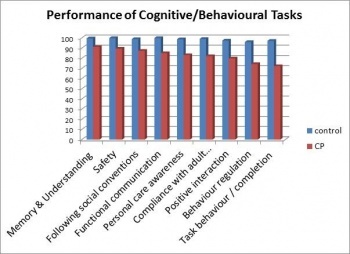 Children with CP also had lower levels of performance in cognitive/behavioural tasks compared to able-bodied students. An additional study was completed by Hilderley and Rhind in order to investigate elementary school children with CP’s perceptions on the advantage and barriers to attending mainstream physical education classes. 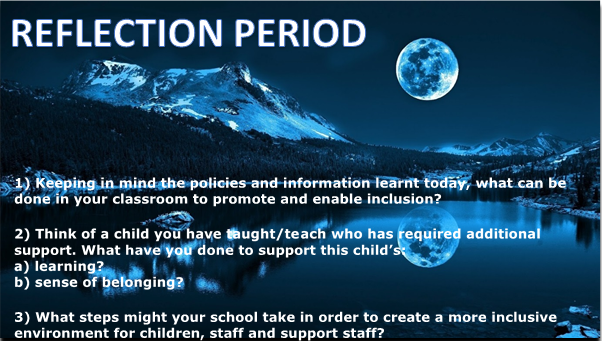 Attitudinal (of peers/staff and child) In conclusion, there is an obvious need for mainstream school teachers to work on promoting the potential advantages and overcoming barriers to the inclusion of students with CP. Additionally, it is clear that this is done most easily through understanding people’s own perceptions on inclusion. It is the right of every child between the ages of 5 – 16 years old to receive an education, and to be offered a free place at a state school. This framework extends to children and young adults with disability. The Equality Act (2010) states that it is against the law for schools and other education providers to discriminate against children with disability. Disability exists in many children and young people who have SEN. The Equality Act (2010) defines disability as ‘A physical or mental impairment which has a long-term (a year or more) and substantial adverse effect on their ability to carry out normal day-to-day activities’. Cerebral Palsy is classed as a disability as it is a life-long condition which needs regular input for specialists and therapists. Individuals with disability often require higher levels of provision, to ensure they are given the same opportunities than those who are not disabled. In order to aid the delivery of the national curriculum to children and young people with SEN, an Individual Education Plan (IEP) can be designed to optimise the education that the individual receives. Using the curriculum being followed as a basis, the IEP creates strategies which are being utilised in order to help them meet their additional needs. In the 1980’s, Linda Bidabe designed the Movement Opportunities Via Education (MOVE) program. The program was designed, as it was being found that pupils with severe disability were leaving school with less skills than when they first attended. The emphasis of the program is to develop functional and meaningful outcomes for the individual utilising current theories of motor development and activity based programs. The program has been developed to support those with differing levels of abilities and in a multitude of different settings. 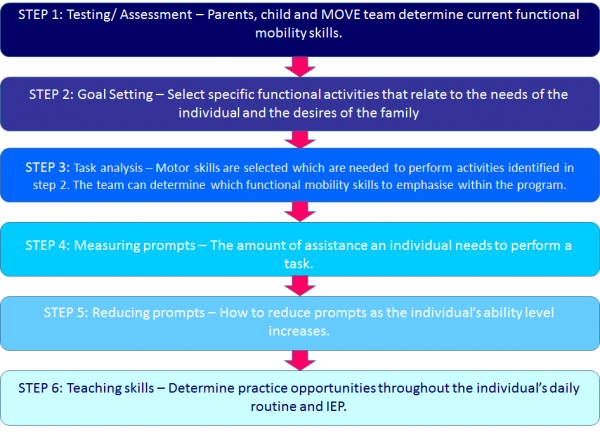 A top-down Motor milestone assessment is used; therefore concentrating on the current abilities of the child. The Council for Disabled Children (CDC) is a blanket term for a group of organizations that hold a range of perspectives on inclusion. It is a group of council members with diverse backgrounds including professionals, parent representatives and representatives of disabled people. The CDC’s main sector is based in England, but with links to other UK nations. The CDC celebrates what is working well in the education system and family life for children and young people with disabilities and demonstrates this through their policies. 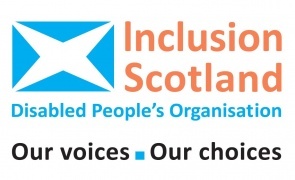 The CDC, Inclusion Scotland and Learning and Teaching Scotland (LTS) are three organisations which support and promote the inclusion of children with disabilities into mainstream schooling. The CDC believes that special schools should hold a close link to the mainstream setting so that one day all children are included into the mainstream schooling system. "All children and young people will have access to mainstream education unless there are exceptional circumstances." 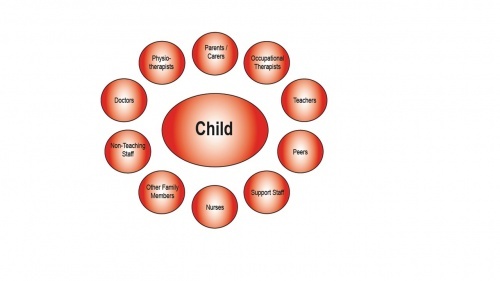 The CDC believe that by promoting inclusion, both disabled children and their non-disabled peers benefit. Separating children with disability does not prepare them for life in a predominantly non-disabled world. It is believed disabled individuals are happy to attend mainstream schools, as it allows both them and non-disabled individuals for later in life. All the while, The Education Act (2004) ensures those who require extra support receive it. It is important for teachers to understand that children with CP enjoy the same types of activities and can do the same types of activities that children without CP can. In 2012 Scottish Disability Sport (SDS) received financial backing from both the Scottish government and Education Scotland in order to offer disability inclusion training. The training is aimed at early years and primary teachers, specialist PE teachers, trainee teachers and learning support staff. It is offered at no cost. The training is tailored to encourage disabled children to lead a full and active lifestyle, through inclusion with their non disabled peers. This physiopedia page aimed to engage and educate the mainstream primary school teacher on the importance of physical activity for children with Cerebral Palsy. 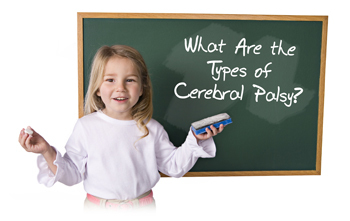 Upon viewing this page, the learner should now be aware of and understand what Cerebral Palsy is, the way in which it presents itself and the way in which it affects children of a school going age. As is seen in the evidence provided there are major benefits related to incorporating regular physical activity into the child’s daily class schedule. The most recent literature and guidelines have been included in this resource to help provide mainstream teachers with all the necessary information and tools to maximise the child’s physical capabilities within a school setting. These include exercise principles, health and safety considerations and physiotherapeutic interventions. A large selection of exercise interventions have been demonstrated and critiqued throughout the resource, providing the learner with a large variety of potential exercise activities which they may been unaware of prior to reading this resource. Overall, it is hoped that the information provided in this physiopedia page can be integrated by the mainstream school teacher into their class schedule, thus providing the maximum benefits for children with Cerebral Palsy. ↑ MUTCH, L., ALBERMAN, E., HAGBERG, B., KODAMA, K. and PERAT, M.V., 1992. Cerebral palsy epidemiology: where are we now and where are we going? Developmental Medicine and Child Neurology. vol. 34, no. 6, pp. 547-551. ↑ MCBURNEY, H., TAYLOR, N.F., DODD, K.J. and GRAHAM, H.K., 2003. A qualitative analysis of the benefits of strength training for young people with cerebral palsy. Developmental Medicine and Child Neurology. , vol. 45, no. 10, pp. 658-663. ↑ 12.0 12.1 12.2 12.3 12.4 12.5 KELLY, M. and DARRAH, J., 2005. Aquatic exercise for children with cerebral palsy. Developmental Medicine and Child Neurology. , vol. 47, no. 12, pp. 838-842. ↑ 13.0 13.1 13.2 13.3 13.4 13.5 VERSCHUREN, O., KETELAAR, M., GORTER, J.W., HELDERS, P.J., UITERWAAL, C.S. and TAKKEN, T., 2007. Exercise training program in children and adolescents with cerebral palsy: a randomized controlled trial. Archives of Pediatrics and Adolescent Medicine. , vol. 161, no. 11, pp. 1075-1081. ↑ 14.0 14.1 FRAGALA‐PINKHAM, M., HALEY, S.M. and O’NEIL, M.E., 2008. Group aquatic aerobic exercise for children with disabilities. Developmental Medicine and Child Neurology. , vol. 50, no. 11, pp. 822-827. ↑ 15.0 15.1 15.2 15.3 DARRAH, J., WESSEL, J., NEARINGBURG, P. and O'CONNOR, M., 1999. Evaluation of a community fitness program for adolescents with cerebral palsy. Pediatric Physical Therapy. , vol. 11, no. 1, pp. 18-23. ↑ 16.0 16.1 16.2 16.3 DAMIANO, D.L., 2006. Activity, activity, activity: rethinking our physical therapy approach to cerebral palsy. Physical Therapy. Nov, vol. 86, no. 11, pp. 1534-1540. ↑ 17.0 17.1 17.2 17.3 17.4 17.5 17.6 FOWLER, E.G., KOLOBE, T.H., DAMIANO, D.L., THORPE, D.E., MORGAN, D.W., BRUNSTROM, J.E., COSTER, W.J., HENDERSON, R.C., PITETTI, K.H., RIMMER, J.H., ROSE, J., STEVENSON, R.D., Section on Pediatrics Research Summit Participants and Section on Pediatrics Research Committee Task Force, 2007. Promotion of physical fitness and prevention of secondary conditions for children with cerebral palsy: section on pediatrics research summit proceedings. Physical Therapy. Nov, vol. 87, no. 11, pp. 1495-1510. ↑ 19.0 19.1 19.2 CHAD, K.E., BAILEY, D.A., MCKAY, H.A., ZELLO, G.A. and SNYDER, R.E., 1999. The effect of a weight-bearing physical activity program on bone mineral content and estimated volumetric density in children with spastic cerebral palsy. The Journal of Pediatrics. , vol. 135, no. 1, pp. 115-117. ↑ 20.0 20.1 20.2 UNGER, M., FAURE, M. and FRIEG, A., 2006. Strength training in adolescent learners with cerebral palsy: a randomized controlled trial. Clinical Rehabilitation. Jun, vol. 20, no. 6, pp. 469-477. ↑ 21.0 21.1 21.2 21.3 21.4 DAMIANO, D.L., KELLY, L.E. and VAUGHN, C.L., 1995. Effects of quadriceps femoris muscle strengthening on crouch gait in children with spastic diplegia. Physical Therapy. Aug, vol. 75, no. 8, pp. 658-67; discussion 668-71. ↑ DAMIANO, D.L. and ABEL, M.F., 1998. Functional outcomes of strength training in spastic cerebral palsy. Archives of Physical Medicine and Rehabilitation. , vol. 79, no. 2, pp. 119-125. ↑ EEK, M.N., TRANBERG, R., ZÜGNER, R., ALKEMA, K. and BECKUNG, E., 2008. Muscle strength training to improve gait function in children with cerebral palsy. Developmental Medicine and Child Neurology. , vol. 50, no. 10, pp. 759-764. ↑ LEE, D.C., ARTERO, E.G., SUI, X. and BLAIR, S.N., 2010. Mortality trends in the general population: the importance of cardiorespiratory fitness. Journal of Psychopharmacology (Oxford, England). Nov, vol. 24, no. 4 Suppl, pp. 27-35. ↑ PARKER, D.F., CARRIERE, L., HEBESTREIT, H. and BAR-OR, O., 1992. Anaerobic endurance and peak muscle power in children with spastic cerebral palsy. American Journal of Diseases of Children. , vol. 146, no. 9, pp. 1069-1073. ↑ RAINGRUBER, B. and ROBINSON, C., 2007. The effectiveness of Tai Chi, yoga, meditation, and Reiki healing sessions in promoting health and enhancing problem solving abilities of registered nurses.Issues in Mental Health Nursing. , vol. 28, no. 10, pp. 1141-1155. ↑ 31.0 31.1 HENDERSON, R.C., LARK, R.K., GURKA, M.J., WORLEY, G., FUNG, E.B., CONAWAY, M., STALLINGS, V.A. and STEVENSON, R.D., 2002. Bone density and metabolism in children and adolescents with moderate to severe cerebral palsy. Pediatrics. , vol. 110, no. 1, pp. e5-e5. ↑ 32.0 32.1 WIART, L., DARRAH, J. and KEMBHAVI, G., 2008. Stretching with children with cerebral palsy: what do we know and where are we going? Pediatric Physical Therapy : The Official Publication of the Section on Pediatrics of the American Physical Therapy Association. Summer, vol. 20, no. 2, pp. 173-178. ↑ HARGREAVES, D.A. and TIGGEMANN, M., 2004. 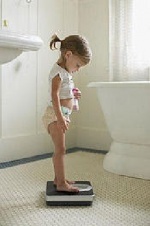 Idealized media images and adolescent body image:“Comparing” boys and girls. Body Image. , vol. 1, no. 4, pp. 351-361. ↑ EHRMAN, J.K., GORDON, P.M., VISICH, P.S. and KETEYIAN, S.J., 2013. Clinical exercise physiology. Human Kinetics. ↑ EDUCATION AND LEARNING., 2014. Types of School [online]. [Viewed 16 November 2014]. Available from: https://www.gov.uk/types-of-school/overview. ↑ 39.0 39.1 THE NATIONAL ARCHIVES. (2010). Equality Act 2010. [online]. [Viewed 16 November 2014]. Available from:http://www.legislation.gov.uk/ukpga/2010/15/part/6/enacted. ↑ DEBENHAM, L., 2012. The Special Education Needs and Disability Act. [online]. [Viewed 8 November 2014]. Available From: http://www.aboutlearningdisabilities.co.uk/special-educational-needs-disability-act.html. ↑ KERN COUNTY SUPERINTENDENT OF SCHOOLS, 1990. MOVE: Mobility Opportunities Via Education. Bakersfield, CA, Little green press. ↑ VAN DER PUTTEN, A., VLASCAMP, C., REYNDERS, K and NAKKEN, H., 2005. Reducing support: research into the effects of movement-oriented activities on the level of support when performing movement skills for children with profound intellectual and multiple disabilities. Postbus, Groningen: Stichting kinderstudies. ↑ BIDABE, L., BARNES, B., WHINNERY, W., 2001. MOVE: Raising expectations for individuals with severe disabilities. Physical Disabilities: Education and Related services. vol. 19, no. 2, pp. 31-48.